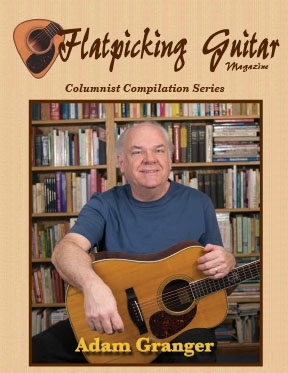 This book includes every column that Adam Granger produced during the 20 years we published Flatpicking Guitar Magazine. There are 120 articles in this 258 page book and 123 mp3 audio files are included. We didn't produce audio CDs for our first three years, but for this project Adam went back and recorded audio for those columns to include in this book. So, every column that included tab has corresponding audio tracks. The original topic for Adam’s column was “Flatpicking Fiddle Tunes” and he pretty much kept to that topic for all 120 issues. When we began the magazine we asked Adam to address this topic because he had already produced a wonderful book Granger’s Fiddle Tunes for Guitar, with 508 fiddle tunes. We figured that someone who had written a book with 508 fiddle tune arrangements for the guitar would be an expert on the topic. We were not wrong! Adam did a fantastic job with each column. An extra bonus to each of Adam’s columns was his parting words, which he included in a text box at the end of each article. What started out as a short, standard Adam Granger bio at the end of his article began to become more creative as the years rolled on. Through each of these short digressions Adam shared his history, wit, humor, and wisdom with readers.